For nearly 30 years, EUROPA Srl has been selling professional ovens to an ever-larger number of bakeries, pastry shops, hotels and pizza shops all over the world. EUROPA brand is synonymous with reliability and innovation in developing products that facilitate the bakers’ lives ever more. Thanks to the cooperation of a close distributor network, Europa is able to guarantee an excellent assistance service to all its customers, whether it is a small pastry shop, a traditional artisan bakery or a bakery industry with loading and unloading automatic systems. 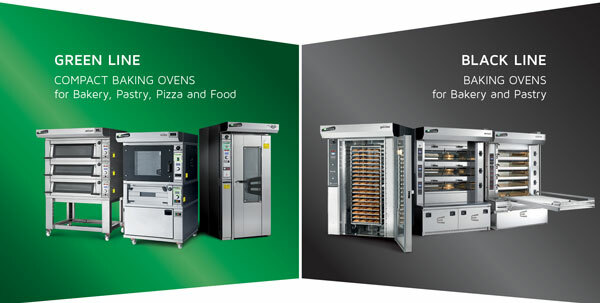 Among the products of the new “Green Line” series, the main ones are those composing the BELL and COOPER series: ultra-compact rotary rack ovens for bakery and pastry products. Thanks to their modular structure, they can be installed in less than 2 hours, they can pass through common doors and they can be fitted into premises with very low ceilings. The special “FREESTYLE” version (patented) allows to reduce the consumptions from 33% to 66% when the baking of a complete rack is not needed: you can decide whether to bake 5, 10 or 15 trays and thus using 1/3, 2/3 or 3/3 of the power. Stainless steel massive structure, modern design, excellent baking quality, versatility and friendly use, are subjects that make the BELL and COOPER series suitable for all customers expecting great performances from a small oven.